Somewhere in the green meadows around the historic university town of Cambridge you may find this small and very unusual business. We make fun and practical footstools in the character of sheep, bulls and cows. From soft white and fluffy, to wild and hairy, each one is unique, with its own name and personality! These sturdy stools are hand made from redwood, and are skilfully upholstered with quality British sheepskins. The bulls and cows have hand turned horns. 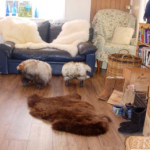 We also sell quality British sheepskin rugs comfy bum pieces and moccasins.